Fast Five (2011), introducing The Rock’s sweaty muscles and the franchise’s biggest cast to Brazil. MY CALL: Hands down my favorite of the franchise (of parts 1-5). This is the most fun, has the coolest plot and produces the most engaging antagonists. High octane testosterone fun for movie-goers who like high speed chases, sweaty biceps, explosions and brawling. MORE MOVIES LIKE Fast Five: Gone in 60 Seconds (2000) for one. Of course, there are also a lot of other Fast and Furious films. 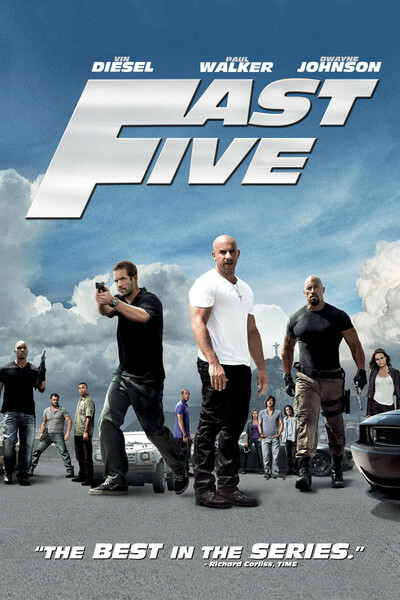 Personally, after the original (for the sake of historical franchise significance), I’d only recommend this fifth installment (for a second opinion check out Mark’s review of Fast Five), Fast and Furious 6 (2013) and Furious 7 (2015). However, Mark ranked the films quite differently than I did—Ranking Fast and Furious 1-6—and he’d suggest his favorite to be 2 Fast 2 Furious (2003). For yet more Fast and Furious opinions be sure to check out our Podcast on Corona, Belgian Beer, BBQ and the Fast and Furious films and Paul Walker’s 7 Best Fast and Furious Moments. In this fifth installment in the Fast and Furious (2001-2017) franchise, we find our favorite characters in Brazil laying low from the American eyes of Johnny Law…but still jacking cars! Dominic Toretto (Vin Diesel; The Last Witch Hunter, Guardians of the Galaxy, Riddick) continues to choose bare biceps over sleeves, Brian (Paul Walker; Brick Mansions, Hours, Into the Blue) and Mia (Jordana Brewster; The Texas Chainsaw Massacre: The Beginning, Chuck, Dallas) are still an item and as close as ever, and director Justin Lin (Tokyo Drift, Fast and Furious, Fast and Furious 6, Star Trek Beyond)—who helmed parts 3-6 in this worldwide franchise sensation—has become more ambitious with stunts. God bless him for that! We have flipping shredded prison buses, high speed plasma-cutting train heists, rocket launchers, exploding poop-launching toilets, and high speed vault dragging! The fight choreography is getting more interesting (with each sequel), everyone has become a better martial artist, the explosions are bigger and more frequent, and cars continue to function unphased after devastating landings and hits. The action has truly been turned up to an “11” in this sequel and, after the youthful thrill of the 2001 original (I saw when I was 20 years old), this is, by far, the most entertaining and my favorite of the franchise…so far. This film is like high octane testosterone. There’s a lot of flexed-arm finger-pointing, flexed arm-crossing, very few shirts with sleeves, lots of yelling, lots of hard crazy-eyed stare downs, lots of large bald men in sweat-soaked overly snug shirts, and a lot of shiny biceps. It has a lot in common with The Expendables (2010-2014) movies in that respect, only much better. From the moment Agent Hobbs (Dwayne Johnson; Pain and Gain, Ballers, G I Joe: Retaliation) busts on the scene every gym bro is reminded of why he’s their man-crush. He’s all business, he’s a straight up killing machine and…well, it’s The Rock! And whereas we meet Hobbs as an antagonist, we also have our “real villain” Reyes (Joaquim de Almeida; Desperado), a man of the people who spins anecdotes about why Portuguese is spoken in Brazil. He’s exactly the refined villain you like, hate, like to hate, and want to see taken down. Well, a motley crew they do assemble. They have big engines, bigger biceps, big stakes ($100 million), and the biggest team cast in the franchise so far! They meet, greet, hug and smile as we see new friends and old friends reunite. After Brian, Mia and Dom, there’s the long and mysterious Gisele (Gal Gadot; Fast and Furious, Dawn of Justice: Batman vs Superman, Wonder Woman), the calm and cool Han (Sung Kang; Tokyo Drift, Fast and Furious, Ninja Assassin, Bullet to the Head), mouth-running Roman (Tyrese Gibson; Legion, Transformers 1-3, 2 Fast 2 Furious), tech whiz Tej (Chris Ludacris Bridges; Crash, Hustle and Flow, Gamer, 2 Fast 2 Furious, and rap performing artist), Santos (Don Omar; Fast and Furious, and performer responsible for Danza Kuduro) and Leo (Tego Calderon; Fast and Furious, Illegal Tender, and rap performing artist). Maybe some of you thought Roman and Tej were funny characters, but Leo and Santos are show-stealing hilarious. Nine in total, and complemented by Hobbs and Reyes. That’s 11 stars in a “part 5” movie! Our characters’ exploits are scored by an outstandingly energized soundtrack. The foot chase scene is solid, filmed with numerous wide angle shots capturing the gorgeous cityscape of Rio’s rooftops. Probably the best camerawork among the first five Fast and Furious movies. We are also wowed by one of my favorite movie fight scenes (excluding martial arts movies). When Hobbs and Dom go at it, it’s like two rabid junkyard dogs on steroids. They hits are hard, frequent, and I question how many bruises the actors left the set with at the end of the day (of course, the stunt doubles had it much worse). There weren’t enough windows and plaster walls in that entire warehouse for them to smash or throw each other through. This was a grappling, tackling, face-punch frenzy. My only gripe is that The Rock didn’t win. Not Hobbs, mind you…but The Rock. Later, seeing Dwayne “The Rock” Johnson limp is like going to SeaWorld to see a water show starring a killer whale with a captivity-rendered limp dorsal fin. It’s just not right. LOL. Then there was the vault chase scene…STUPENDOUS! At every turn we find so much property damage as they swing that vault across the road in their wake through crinkled cars and mangled buildings. Oh, and they were wholesale MURDERING cop cars, smashing up more vehicles than a Bad Boys Michael Bay flick. Winding down after their victory and reminding us that they’re all one big criminal family, is that we have such a happy conclusion. Much like the Lord of the Rings trilogy (2001-2003) we have a bunch of endings, only these are much more succinctly handled and won’t bore audiences. Brian and Mia got a beach house to raise their child, Tej and Roman jockey for “best car in the hemisphere,” Han and Gisele go honeymooning on the autobahn, and Santas and Leo do playfully dumb things with their money in casinos…it’s all very nice. You’ll leave this movie happy. So go see it (again), be thrilled, and be happy.